A must for any one who loves sailing, who is affected by dyslexia or who enjoys inspirational true life tales, Helen O’Neill’s biography Life Without Limits (Random House Australia) has been described as ‘the ultimate triumph over adversity story’. This book tells the story of David Pescud, a profoundly dyslexic man who went from being a suicidal, illiterate failure to an inspirational success. David Pescud hid his inability to read from the world. He managed to run a successful business and retired with the ambition of sailing around the globe. Instead he found himself skippering crews of able and disable-bodied sailors in the Sydney to Hobart ocean yacht race, and launching a charity for disabled children. In the deadly 1998 Sydney to Hobart race, David’s remarkable crew not only finished the course but won its category. A world record circumnavigation attempt would not be far behind. 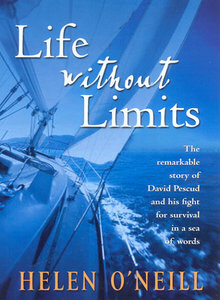 Life Without Limits (also released as a talking book by ABC Audio, narrated by actor David Field) inspired a television series – DisAble-bodied Sailors, a four-part documentary which screened on SBS. ‘Helen O’Neill, noting the irony of writing the story that her subject will never read, captures Pescud’s honest, humorous and colourful voice, passionate and caring personality, and his inspiring spirit of adventure. This story will ￼￼￼change how you see print, as well as how you see disability’ – (Limbs 4 Life review). In 2014 David Pescud won the National Pride of Australia Inspiration Medal for his work with disabled children. For more about Sailors With DisABILITIES click here.